Sunshine galore describes this simple and sweet study of yellow. 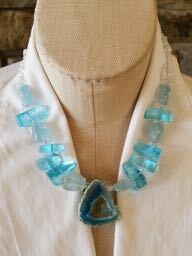 Calcedony briolettes highlight a Lucite pendant. 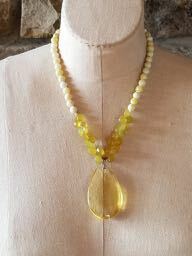 Finishing with faceted yellow jade and Sterling clasp. 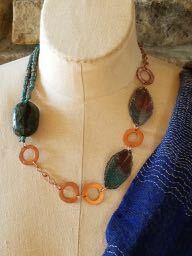 Casual comfort wearing this mix of copper, enameled copper, Kingman turquoise, and a double length of Africa trade beads. 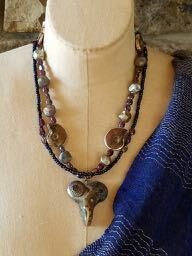 Here is a funky little double stranded necklace with Sterling wrapped Ammonite Raku beads, and a Raku heart. Signed by the artist. 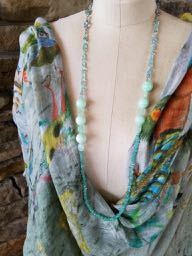 Irridescent seed beads and a Sterling clasp finish this "Art to Wear" piece. 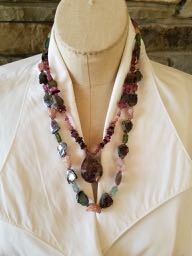 Polished Tourmaline slabs and Tourmaline rondells flank a fabulous lampwork pendant. 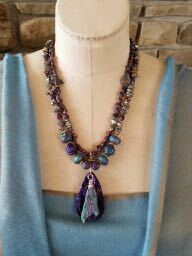 Greens, lavender and purple make this necklace one for any occasion. Bronze "S" clasp. 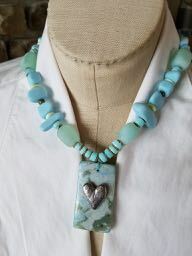 Smooth Larimar rounds with Angel skin coral and aquamarine accents. You can close your eyes and feel the ocean breeze just looking at this simple raw beauty. Patina copper clasp. 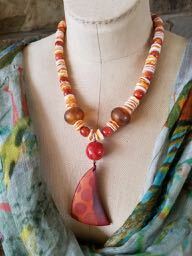 Lampwork, Clay, and Amber Cross with Sterling hook and eye clasp. 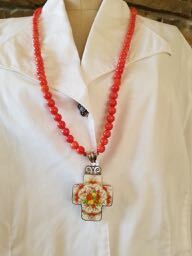 Porcelain cross set in Sterling with coral needs. 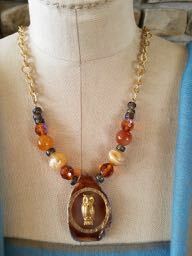 This necklace goes over the head, no clasp necessary. 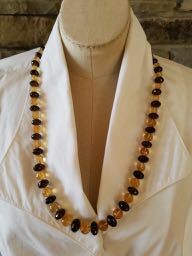 Beautiful AAA Citrine faceted rounds with Cognac quartz rodelles. 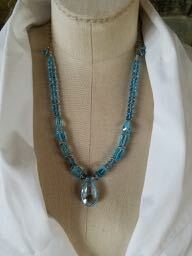 28" with a large hook and eye clasp. Icey blues of rough natural blue topaz with glass and agate druzy. This necklace can go anywhere, anytime. Box clasp. Mother of Pearl/Ammonite pendant with topaz, lampwork and trade beads - all mixed up in this triple strand beauty with lobster Sterling clasp. 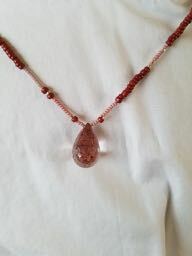 Two absolutely beautiful strands of tourmaline in a necklace with Sterling hook and eye clasp. 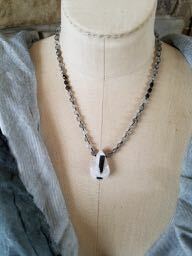 Sea glass and agate with a pewter heart and Sterling toggle clasp. 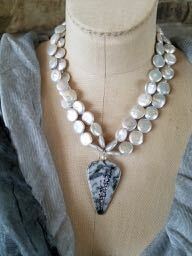 Lepidicrocite and trade beads make this the perfect T-shirt topper with a simple Sterling toggle clasp. 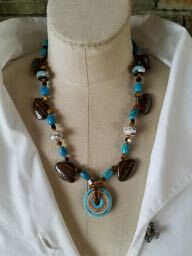 Super fun turquoise, tiger eye and lampwork finished with Sterling. Multiple cuts of Topaz ewith Sterling heart claw clasp and finishers. 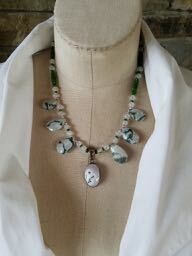 Tsavorite with Zebra Kaspersky, Crystal and Sterling with toggle clasp. 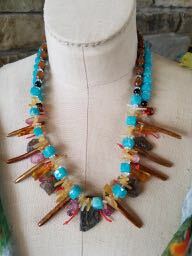 Andalucite slabs, coral, tourmaline, appetite cubes, and seaweed with bronze hook and eye closure. 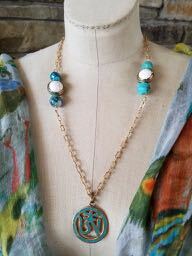 An Ohm pendant dropped from gold fill chain with faceted turquoise and Tibetan beads. Agate and crystal make this simple owl pendant an easy accent for any occasion. 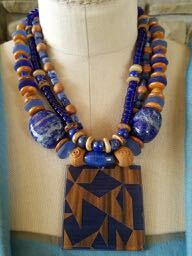 This triple strand of blues is mixed with vintage wood carved beads, solodite, glass and lapis. The pendant square isn from the national gallery of Canada. Luxury in length. 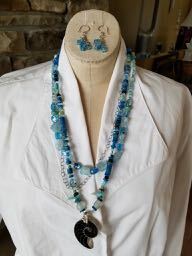 Amazonite, chrysophase, topaz, and aquamarine with Sterling. Lampwork pendant with rainbow obsidian, shell, and seaweed. Statement piece! 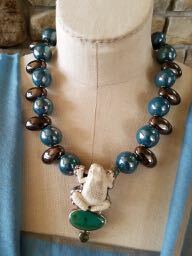 Carved frog wrapped in Sterling with turquoise inset. 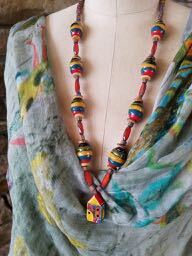 Kazuri beads hand crafted in Niarobi finish this one of a kind wearable art necklace. Titanium druzy pendant wrapped with Sterling surrounded by Raku and pyrite. Finished with hammered pewter toggle clasp. 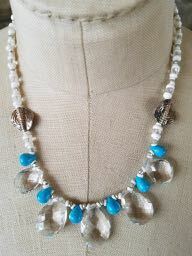 Crystal and sleeping beauty turquoise briolettes with shell and hill tribe silver. 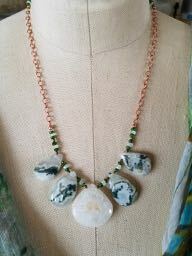 The Solar quartz pendant is flanked by zebra quartz, tsavorite and moonstones. Copper finishes. 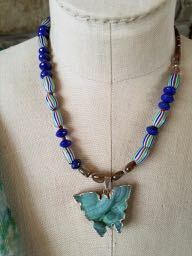 Druzy butterfly with trade beads, andalucite, and lapis. Magnetic clasp. 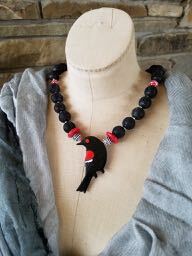 Enamel Red Wing Blackbird pin hanging as a pendant from cinnabar and kazuri clay beads. Pewter lobster closure. 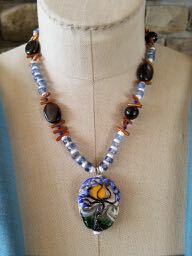 Polymer clay pendant dropped from lampwork and cheq glass beads. Grey goes with everything. 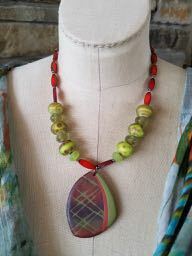 This pendant made by Wendy Stanwick is featured with coin pearls and a pewter toggle clasp. Black tourmaline in quartz strung with black spinel cubes. It's the United nations of jewelry. 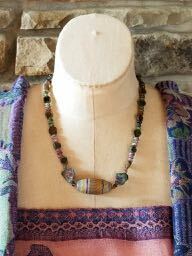 Kazuri beads from Africa, Trade beads from Indonesia, cheq glass and a little house from Rochester, New York make the over the head piece fun to wear alone or stacked. 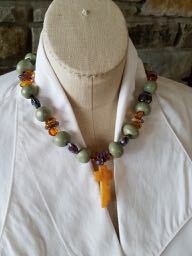 Super colors, great for a casual outing. Ready for some sun. 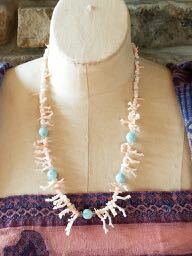 Polymer clay pendant dropped from coral, spiney oyster and glass. Casual and fun. 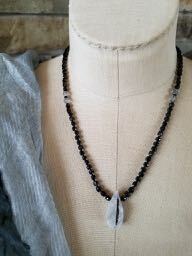 Simple pendant of black tourmaline in quartz strung with black rutile quartz.